InfoPV - Process Validation and Test Method Validation Software - Now Available! New location in Costa Rica to serve Latin America! MyFDA Academy e-Learning Center is now online. MyFDA Academy is an e-learning center where people involved in the medical device, pharmaceutical, and biotech industries can take online training courses on a variety of topics relevant to the Quality Management System and/or Regulatory Compliance aspects of these industries. InfoMed version 9i is now available with full eMDR support. Version 9i is a full web application and offers many enhancements over Version 8, such as workflow rules, improved email notifications, enhanced reporting and trending, etc. Click here to view some of the features. For more information, please contact us at support@makromed.com. InfoCAPA version 9i is now available. InfoCAPA allows you to manage non-conformance and Corrective/Preventive Action programs within your quality system. Version 9i is a full web application and offers many enhancements over Version 8, such as workflow rules, email notifications, enhanced reporting and trending, etc. For more information, to schedule a demo, or to request access to a trial system, please contact us at support@makromed.com. For more details on the features and workflow of InfoCAPA, you can also click here. InfoAudit Version 9i is now available. Version 9i is a full web application and offers many enhancements over Version 8, such as workflow rules, improved email notifications, enhanced reporting and trending, etc. Click here to view some of the features. For more information, please contact us at support@makromed.com. In addition, the FDA's GTP Tissue Audit template is now available for use in InfoAudit. Do you want to install InfoSuite as a thin-client system? Would you like to be able to make all system updates and changes from the server, while also benefiting from increased performance, especially for remote users? Then InfoSuite's web-enabled capability is right for you! This setup will work with either Citrix or Terminal Server. Click on the link below to see a diagram (PDF format) of the web-enabled architecture. Using the current FDA's guidance document, determine if the Part 11 requirements apply to the system. Conduct and document risk assessment to justify not implementing Part 11 controls, where appropriate. Conduct Part 11 gap analysis and recommend specific actions to make the system Part 11 compliant. Conduct formal Part 11 compliance audit throughout the organization.  InfoPV version 10i is now available. InfoPV is a comprehensive software solution for managing both process validations and test method validations in accordance with the FDA's 21 CFR Part 820.75 regulation and ISO 13 485 standard. InfoPV 10i provides a holistic approach to process validation, starting with a high level view of the entire manufacturing line for a product family and then zooming into the individual process steps involved. It management of all validation activities to establish that the process consistently produces an output that meets predetermined requirements and the overall manufacturing line produces a product that meets the finished product requirements.